Spurs New Stadium: Where Will Their Neutral Home Be? Tottenham are prepared to play at a neutral ground for a year, due to a newly upgraded stadium that is set to take longer than expected. Tottenham have been linked with a move to the MK Stadium, Wembley, The Emirates or no where until there stadium is rebuilt which could be done by 2017, which teams stadium will adopt the Spurs? White Hart Lane is going to be bigger and be a stadium that looks like a glimpse of the future, the stadium will be in the same place and will be the shape of Arsenals' stadium but will have a better look. On Sky Sports News they had a poll vote and it was Wembley, The Emirates, the MK Satdium and no where but now Brightons Satdium has joined the vote and Wembley won the vote. If Spurs where to move transfer to the Emirates the North London Derby would be in the same stadium for both games just like the Milan derby, (AC Milan and Inter Milan). The stadium will cost approximately £400m to build a 56,000-seat stadium, stores and a podium around it, will be raised by selling naming rights and bank borrowing. We do not know what will be White Hart Lanes replacement name is but we do know they will be rocking the stadium in 2017. 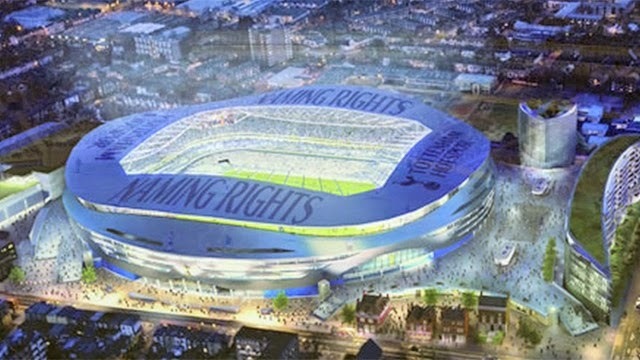 TheSportMatrix • We Live For Sport: Spurs New Stadium: Where Will Their Neutral Home Be?